Each known work is discussed and analyzed: content, chronology, genre, significance, meaning, genetic relationship to other works, ancient and modern scholarship, and influence. This text is a must for anyone who teaches or reads Latin and/or Modern Literature. 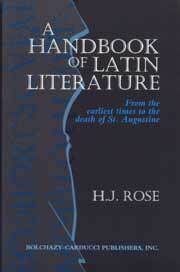 [Rose’s] book in fact has its value as a dictionary of Latin literature besides that of a history. Having studied Latin all throughout high school, I was thoroughly proficient in grammar and mythology. However, I always felt lacking when it came to the wealth of Latin literature available. Studying Vergil's epic, the Aeneid, took a year in itself. At this rate, I would never become substantially familiar with Latin literature. Then I was introduced to A Handbook of Latin Literature, a comprehensive reference of all significant authors and works. While the degree of detail makes this book no easy read, the same factor makes it extremely useful, as I can just look up any author or work when I come across an unfamiliar reference and learn everything I need to know. For the Latin scholar, I highly recommend this book as a collection of facts about literature. For the rest of us, A Handbook of Latin Literature serves as an excellent reference book for a topic that is too often ignored.